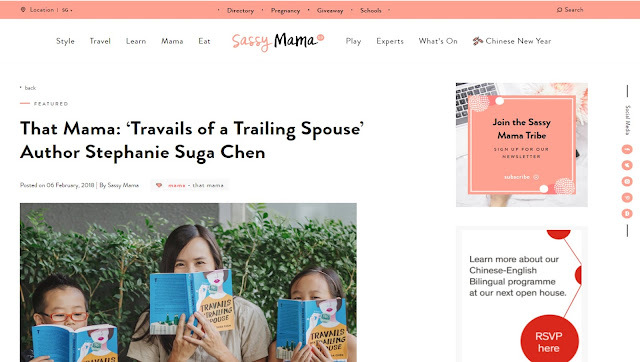 "In recent weeks it would have been hard to miss Travails of a Trailing Spouse, the super fun debut novel from American mama Stephanie Suga Chen that opened at #2 on the Straits Times bestsellers list. When we learned that Stephanie, who’s lived in Singapore since 2012, only recently made the switch to writing after a high-flying career in finance, we just had to find out what makes this mama tick! We caught up with Stephanie and her two kids, ages 10 and 7, to find out some of the secrets to her success, from living with in-laws, to the brilliant concept of “alone lunches” with the kiddos every Sunday. Read on for more, mamas!"